This view looks south at Lake Alpine, a reservoir located along California 4 east of Bear Valley and west of Ebbetts Pass in the Sierra Nevada. 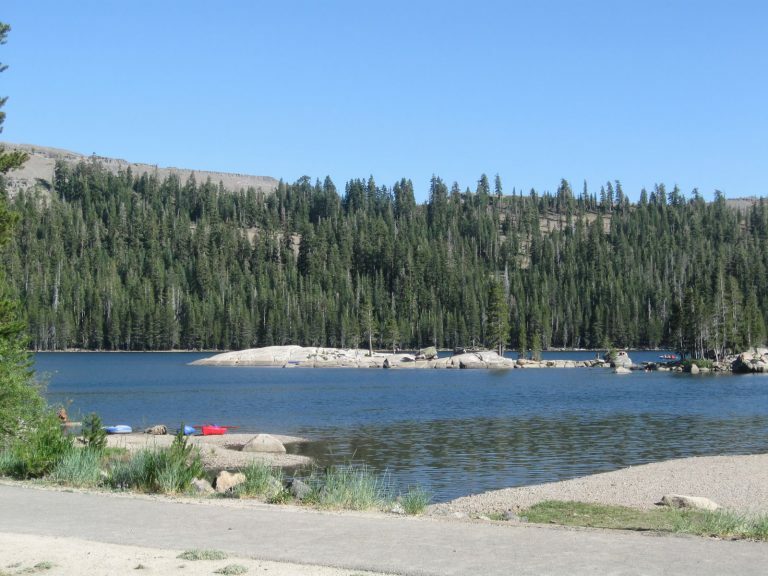 The lake is operated and managed by the Northern California Power Agency, while national forest campgrounds are located along the north shore of Lake Alpine. Photo taken 07/18/09. California 4 connects the San Francisco Bay Area with the Sierra Nevada, passing through the city of Stockton along its 192-mile course. The highway originates at Interstate 80 near Hercules, and begins as a four-lane expressway from Hercules east toward Martinez. Once in Martinez, California 4 becomes a full freeway known as the California Delta Highway. Along this industrial route, California 4 serves a number of power plants, ports, and industries in Concord, Pittsburg and Antioch. The freeway then connects to the California 160 high bridge that crosses over the Sacramento/San Joaquin River Delta on its route north to Sacramento. East of California 160, California 4 becomes a very busy two-lane highway on its way to Stockton, one of the largest cities of the Central Valley. California 4 is the principal route between the Central Valley and the Delta. Although California 4 is briefly a freeway between Interstate 5 and California 99, it resumes as a busy, two-lane road as it approaches the Sierra Nevada foothills. Passing the Gold Country Highway (California 49) in Angels Camp, California 4 starts to ascend toward Ebbetts Pass. Losing traffic as it progresses east, the state route passes by the mountain communities of Calaveras County. Beyond California 207, a spur route into Bear Valley Ski Area, and Lake Alpine, California 4 narrows to a one and a half lane road across Ebbetts Pass. On the rainshadow side of the Sierra Nevada, California 4 descends toward its eastern terminus at California 89 south of Markleeville and west of Monitor Pass. Some maps show California 4 continuing east into Nevada via California 89 north and California 88 east, and California 4 west is signed from California 88 through Markleeville. East of Bear Valley Mountain Resort and west of Ebbetts Pass is Lake Alpine, a reservoir managed by the Northern California Power Agency. This warning sign advises lake users to watch for submerged objects as the level of the lake may fluctuate. Stanislaus National Forest manages a campground at this location as well. Photo taken 07/18/09. A boat launch ramp into Lake Alpine is located across from the Lake Alpine Lodge. Boat rentals are available at the lodge, and a floating dock allows access over the water for boarding. Photos taken 07/18/09. Lake Alpine as seen from the central boat launch in the campground. The lake is surrounded by mountains and provides electrical generation and water to users downstream. Campgrounds line the lake on the north shore. Photos taken 07/18/09. Cape Horn Vista is found on California 4 a few miles east of Lake Alpine at the point where the highway passes through a rock outcropping. Situated at an elevation of 7,960 feet above sea level, the vista offers excellent views toward the Dardenelle Range, including Elephant Rock, and the Carson-Iceberg Wilderness Area of Stanislaus National Forest. Photos taken 07/18/09. "Community Celebration Marks Completion of Highway 4 Widening Projects." Contra Costa Transportation Authority (CCTA), press release. July 20, 2016. "Highway 4 bypass safety questioned." East Bay Times, June 8, 2008. Balfour Road, Contra Costa Transportation Authority (CCTA) project web site. "Highway 4 extension to open soon." The Record (Stockton, CA), December 9, 2016. SR 99 - South Stockton Six-Lane Widening Project. Caltrans project web site.